Most people don't realize where their apples come from, which is not surprising. It seems like Fuji, Red Delicious, Gala... they were always in the grocery store but their story is more complex. 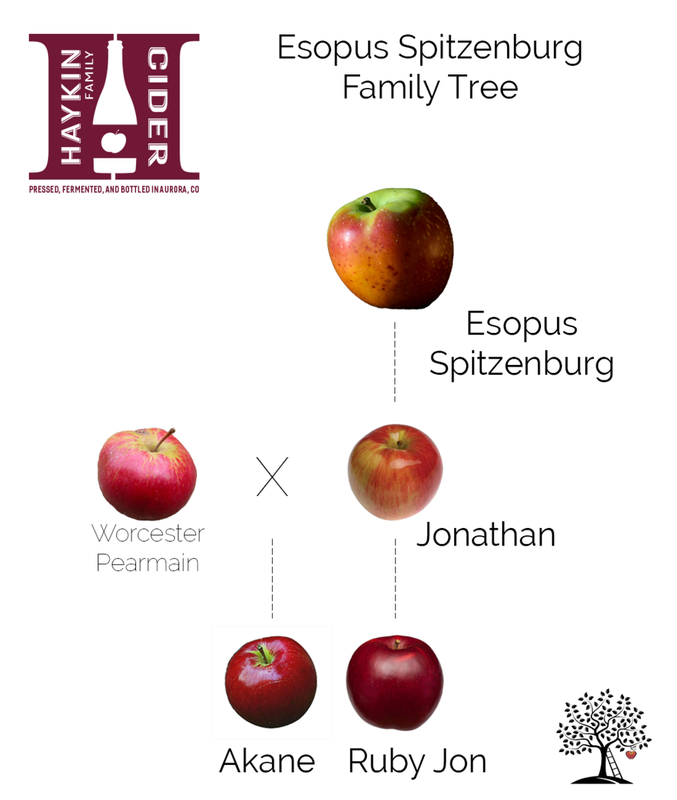 First, we will give you a bit of a background on how apples change and propagate, then we will talk about the Esopus Spitzenburg Family Tree. There are literally thousands of apple varieties in the world. Hard to believe since most people are only familiar with the five or six that you can find in the grocery store. But with the increased popularity of farmers markets, our tastebuds are (re)expanding. Here's a little background on how apple varieties happen. One source puts it eloquently - The two basic ways new apple varieties happen are serendipity and science. "The seed is a cross between the female parent (the flower/fruit from the tree that the apple came from) and the male parent (the variety that produced the pollen). How does it play out in real life? Consider the following chance seedling: A Red Delicious tree is pollinated by pollen from a nearby Jonathan tree. Although it yields a Red Delicious apple, the seeds in the fruit are a cross of the two parent varieties (Red Delicious and Jonathan). If you planted one of the seeds from that apple, it would grow into a tree that would yield a new, unique variety, one that contains some characteristics of both parent varieties. Like children, each new tree would have a completely unique, individual mix of characteristics from the parent seeds. Chance seedlings are usually found growing in unusual places, such as fence rows or barnyards. Since the origin of the parent blossoms are unknown - someone could have thrown an apple core anywhere - we can only guess what the parentage of a new chance variety may be." Just like us - an apple is half the "mom" (the originating tree) and half the "dad" (the pollinator). So each tree, planted from the seed, can be totally unique... just like us. Most apple trees are propagated using a grafting technique to maintain the variety. Now that you have a bit of a background, let's talk about our buddy, Esopus Spitzenburg and his family tree! For Colorado Cider Week 2018 we developed a special menu featuring four single varietal ciders from these apples. Stop in and taste a unique flight of these four apples June 7 - 17, 2018 ONLY! He's the grandfather of some of our favorite apples, not to mention a favorite in and of himself. It was discovered early in the 18th century near Esopus, New York, and is reputed to have been a favorite apple of Thomas Jefferson, who planted several of the trees at Monticello. It's been described as "one of the leading American apples ... In particular, it is a good apple for baking pies and are also valued as a cider apple." From our side, we adore the spitz. It's an excellent apple and makes very good cider. Our single varietal Esopus Spitzenburg won First in Class and a gold medal at Great Lakes International Cider & Perry Competition in 2017. It's parent apple is Espous Spitzenburg. It originated from an Spitz seedling in 1826, a random, chance, spontaneous new apple! (See, spontaneous... not science.) It's well known in the midwest and has a good sweet/sharp balance. Here at HFC, we love Jonathan. He's tart and interesting, with notes of pomegranate and red fruit. Our single varietal Jonathan won a bronze medal at Great Lakes International Cider & Perry Competition in 2018. It is a Japanese cultivar developed by crossing a Jonathan apple with a Worcester Pearmain. (This time it was science!) It landed in the US in the late 1930's and is a popular early season apple. Akane is a banner apple for us at HFC. The cider is floral and rich. Our single varietal Akane won a gold medal at the Great Lakes International Cider & Perry Competition in 2018 and a silver at the Royal Bath and West cider competition in 2018. It's a sport of the Jonathan apple. Again, a random, chance, spontaneous new apple! It was actually a "limb mutation" meaning that one limb was different than the rest of the tree! It's known for it's dark ruby red flesh and Jonathan flavor. Our Ruby Jon cider is different than it's parent, Jonathan. It's tartness is a little more subtle and has nice hints of rose petals and stone fruit.